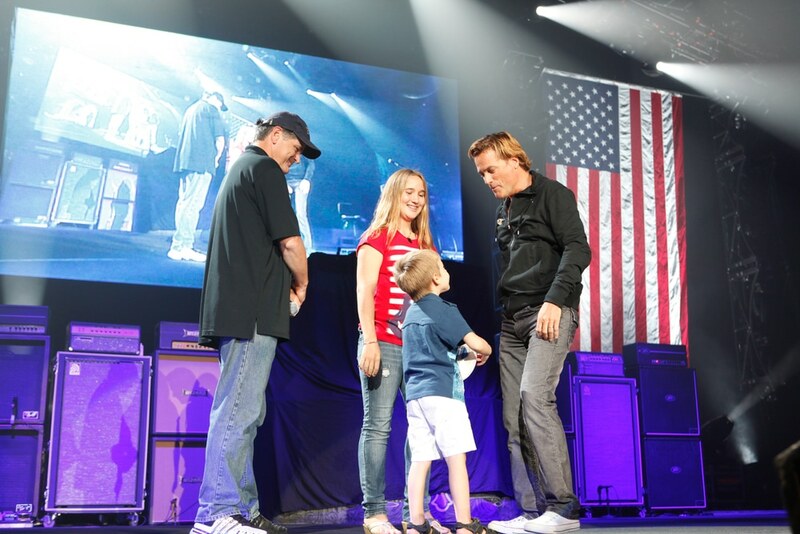 Brandi Anderson and her younger brother Christian joined Sean Hannity and Michael W. Smith on stage at the Freedom Concert in Orlando, Florida on August 14, to pay tribute to their father, Michael Anderson, who lost his life while serving our country. Michael Anderson was killed in Anbar Province, Iraq near Fallujah on May 2, 2004. He was one of five Americans whose lives were taken by an enemy mortar attack. Anderson was a Navy Seabee assigned to Naval Mobile Construction Battalion 14 out of Jacksonville, Florida and was 36 years old when he died. Thousands of people in the UCF Arena at the Freedom Concert were on their feet to honor the sacrifice the Anderson family – and other Gold Star Families like them – have made for our country. Brandi and Christian wore buttons with a photo of their father on their shirts. Brandi was only seven years old when her father was killed and, fighting back tears, explained how difficult it is to grow up without him. “Mom tries to hide the pain,” Brandi said, and explained that her mom does everything she can to fill their lives with joy. Because their father lost his life during a combat mission, Brandi and Christian will be eligible for a Freedom Alliance scholarship in the years ahead when they go to college. Backstage, Karen Anderson and her kids had the opportunity to meet Charlie Daniels and others who performed at the Freedom Concert. Seabees, whose motto is “We Build, We Fight,” have, since World War II, built the infrastructure – operating bases, airstrips, roadways – which are necessary for U.S. forces to carry out and complete their missions in the midst of hostilities. During times of peace, the Seabees are the Navy’s Goodwill Ambassadors and have developed communities throughout the world with construction projects that have improved the lives of millions. Mike Anderson’s service in the Navy Seabees helped to make the world a better place and to make our country safer. God Bless him and all those who serve and sacrifice for our country.